Last week the “Frogs” became pirates! The children did many activities to prepare this game. 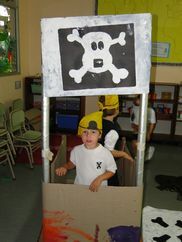 They used flour, water and salt to make “Pirates´ biscuits!”. They baked them and ate them in a picnic in the field. Today, the “froggies“ wore bandanas and eye patches and went on a search for the hidden treasure. They followed various clues. For ex. : “Shhhh, horses sleepping!”, “revuelvo con un palo y los deshechos deshago! !” (the compost bin) ”dónde me lavo las manos y me miro en el espejo? ?” (the bathroom). Visit our Photo Gallery to see how much they worked and enjoyed themselves! !